At Sela, whose name is Hebrew for rock or foundation, school days will alternate between Hebrew and English. In math, for example, students will learn how to add and subtract in English one day, and the next day they’ll pick up where they left off in Hebrew. Language immersion programs aren’t new to the District. Sela is similar to the Washington Yu Ying Public Charter School near Fort Totten, whose Chinese language immersion program also follows the alternating-day model. At least a dozen schools—both charter schools and traditional schools in the D.C. Public Schools system—offer Spanish language programs, including Brookland’s Elsie Whitlow Stokes Public Charter School, which offers both French and Spanish immersion. Sela’s advocates tout the benefits of learning a second language at a young age and insist the Hebrew school will be as popular as the language immersion programs that preceded it, many of which have waitlists thousands of students long. 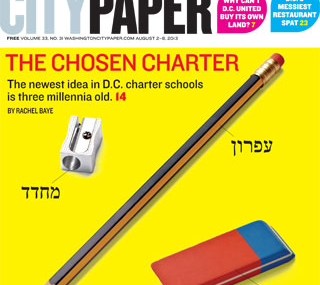 But unlike immersion programs in Chinese, Spanish, and French, Hebrew charter schools—a growing trend nationwide—are often accused of being backdoor channels for funneling public funds into religion. Although as a public school, Sela has limited ties to the Washington Jewish community, Sela could still be perceived as a Jewish school because of the Hebrew lettering on the front of the building and the curriculum’s emphasis on what life is like in Jerusalem, Tel Aviv, and Haifa.